When running errands during the day with my kids in tow, I often hear comments like, “Youmust have your hands full!” or “How do you get anything done?” or, my personal favorite “WOW! You must be exhausted at the end of the day!” Really all three of these are true! But, I wouldn’t change it for the WORLD!!!! And, I absolutely mean that! Now, don’t get me wrong, there are days that I literally want to pull my hair out or that I go outside and scream just a little to get it out, but I can’t imagine working all day long and missing these precious moments in my children’s lives! I am truly blessed to be able to stay at home and see these steps and strides they are taking in their development and in their education! What an honor!!! But, seriously – it can be difficult getting things done around the house. After my 3rd was born, there were many days I was just completely overwhelmed! I didn’t know which way was up and if I was coming or going!! It took me a lot longer to get into a routine with her than it did when I had my second child. But, now that I’ve found what works – IT’S GREAT!!! So, I thought I’d share with you some tactics I use to get things done in a busy house with a FULL schedule!! This is our week! 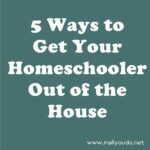 Then, we work in Homeschooling, naps, baby feedings, laundry, dishes, other housework, playtime and MORE!!!! It’s a challenge to say the least! But, I have found a few things that help me! Now, keep in mind I am a list-maker, Type-A personality!!! This may not work for everyone. But, it’s important to find what does! 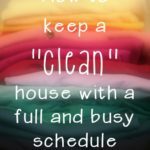 FIRST – I created a laundry schedule!! Yep, that’s right a laundry schedule! Too often I found myself doing 5-6 loads of laundry a DAY and then depressed by the piles that just laid there unfolded for days! So, I made a schedule in a Word document like this one below. This may look like overkill to some of you, but strangely enough it puts this already exhausted, worn-out momma’s mind at ease! I have this posted on the wall between my washer & dryer. I can look at it first thing in the morning and know what 2 loads of laundry I have scheduled for that day! Then, suddenly I don’t feel so overwhelmed!! Two loads is completely doable!!! You may wonder why I have a third column. With 3 kids and 2 under the age of two, you NEVER know what might happen during the day! Someone may get sick, someone may have an overnight accident, a child may get a little carried away outside in the mud! This leaves me open to do an “emergency load” should the need arise!! Something else I created that helps me immensely is my Weekly Meal Plan. You will notice this looks strikingly similar to my laundry schedule. That’s because IT IS!!! It is also made in a Word Document. Ours starts on Thursdays because payday is Wednesday (unless its a holiday week). I also start it on Thursdays because most ads begin on Wednesday, so I can look through them on Tuesday after they come in the mail!! That way I can plan my meals around what’s on sale (beef, chicken, steak, veggies, fruit for snacks, etc.). It has worked VERY well in our house! In fact, it has cut our grocery bill by at least 30%!!!! Why?? Well, with an organized meal plan I only make (or try to only make) ONE trip to the store, which cuts down on those extra items you get when you’re rushing through trying to find something for dinner. It has also cut down the number of times we eat out, since I’ve planned the meal ahead of time…by golly THEY BETTER EAT IT!!! I can also more easily plan for company dropping by at a moment’s notice without the frantic running around trying to figure out what’s to make for dinner! Now, sometimes I might move things around in a week, especially if we leftovers for a lunch, but most of the time we stick to the original schedule. And, as a treat, once a month I allow my husband and oldest child to choose a meal for one day that week. It also allows my son to have at least one meal he likes (or so he says). Well, these are just a couple tips for those of you feeling overwhelmed and overloaded!! I hope they get your brain thinking about what might work for you!! I would love to hear from you all about how you organize your house, chores and lives!!! Great suggestions for a busy household. Thanks for sharing! LOVE the idea of a laundry schedule. that, and the meal plan, will be my new year's resolution! I love this because it is sooo like me!! I also made a word document for household chores (dusting, sweeping, mopping, cleaning bathroom, wiping down fridge, etc.). I separated it into 3 sections… weekly, biweekly, and monthly. I listed along the left side of the spreadsheet the chores under the appropriate section. Beside the weekly chores i noted which days to do what (according to how busy that day typically is during the week and how long that chore takes). Stuff like vacuuming is on weekly, mopping & dusting is biweekly, wiping down fridge & hall walls is monthly. Yes, I said wiping down the walls… I can't stand sticky handprints that lead all the way to the bathroom where the kids wash their hands!!! Then I used columns to put the dates/months, so that i could check it off as i did it. I did all this for 3 reasons… so that I wasn't overwhelmed by the feeling of so much to do & could feel as if I "finished" something each day, so that the hubby knew what his responsibilities were w/o having to ask me (his initials were beside his chores), and so that my house was always ready for company to drop in unexpected (which happens alot in ministry! ).